Greisens form within or closely associated with granites, and the hydrothermal fluids involved are almost certainly of granitic origin. This study shows that such fluids are predominantly aqueous, with only minor involvement of CO2 rich phases. A similar lack of CO2 rich fluids is seen in the granite hosted gold deposits of Hebei and Shandong in China. Although CO2 rich fluids are commonly associated with gold deposits, most of them form from metamorphic fluids. In contrast, the fluids involved in the formation of greisen deposits like those at erzgebirge are dominantly aqueous with only minor CO2 rich phases. The Erzgebirge mountains form the border between the Czech republic and south-eastern Germany. The name means "Ore mountains" in german, and mining started in these mountains in the 12th century. The area was a major source of silver and tin as well as other metals in medieval times. Geologically, the area is famous for its tin greisen deposits and in fact the definition of greisen comes from these deposits. A suite of samples was collected from various tin localities (all inoperative in 2010) for baro-acoustic decrepitation analyses. The sample locations are shown on the following map. Click on the blue "pin" icons for the sample locality name, sample number and GPS waypoint code (if allocated). The samples from the Czech Republic were collected with the help of Petr Rojik from Sokolov and those from Germany with the help of Peter Suhr from Freiberg. Many thanks to these people for their invaluable assistance. Multiple samples from Prebuz are largely similar and lack any low temperature decrepitation. However sample 2122G (H2423, dark blue) has a distinctive peak at 350 C. This is probably due to a very uniform hydrothermal pulse of CO2 rich fluids. 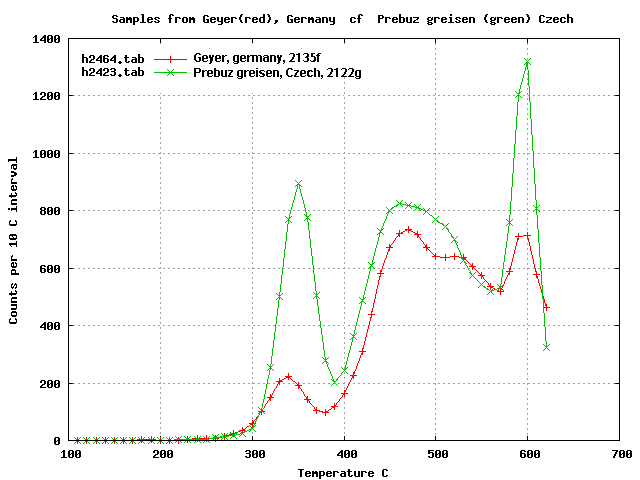 One sample from Geyer in Germany (some 40 Km to the NE) had the same distinctive decrepigram. 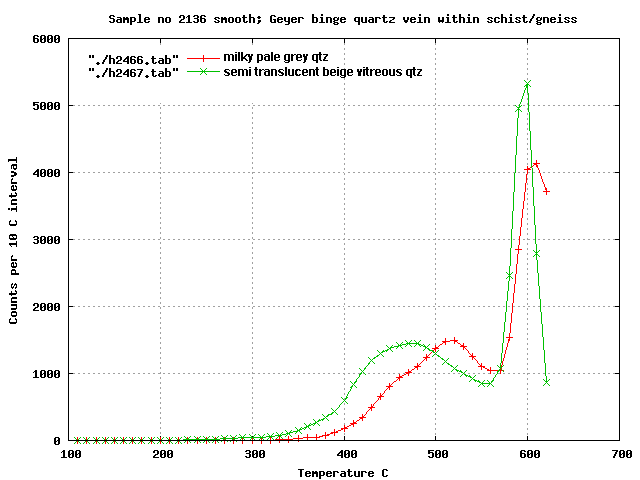 The 2 samples are plotted together for comparison below. The samples from Rolava were from loose waste rock at a millsite, the actual mine being some 1.2Km further east and inaccessible. 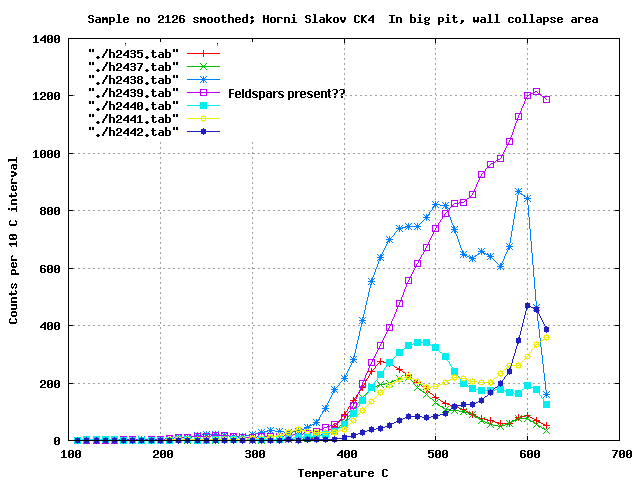 There is a suggestion of CO2 rich low temperature decrepitation in sample 2124c (dark blue), but overall CO2 is not common. The decrepigrams are similar to Prebuz (which is 5 Km SW), but with lower decrepitation intensity. At Rotava, about 10 Km SW from Prebuz, sample 2125a was of milky white quartz and showed similar decrepitation to the samples above. However, the other 3 samples at this site were described as gray-white in colour and these had very weak and indistinct decrepitation. In this case the subtle difference in quartz colour is linked to a dramatic difference in the fluid inclusion population of the samples. 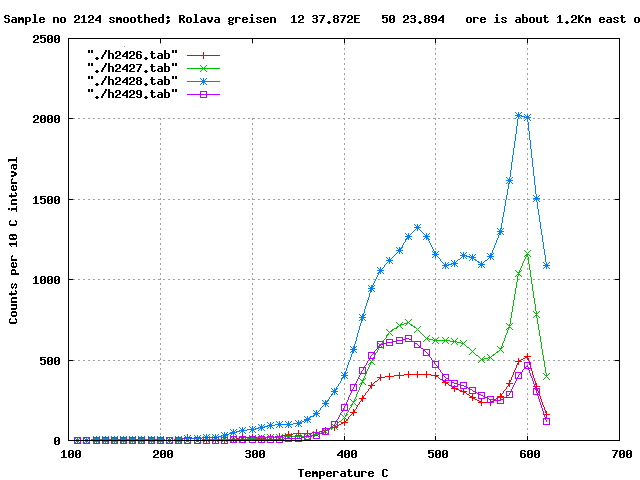 None of the samples show low temperature CO2 caused decrepitation. The Druzba pit is an open cut coal mine near Sokolov and this sample is not a greisen, but a vein of coarse white and mauve dog tooth quartz. This is the only "barren background" sample I was able to collect in the region. It is very different from the greisen samples, with very weak decrepitation, but a distinct peak. 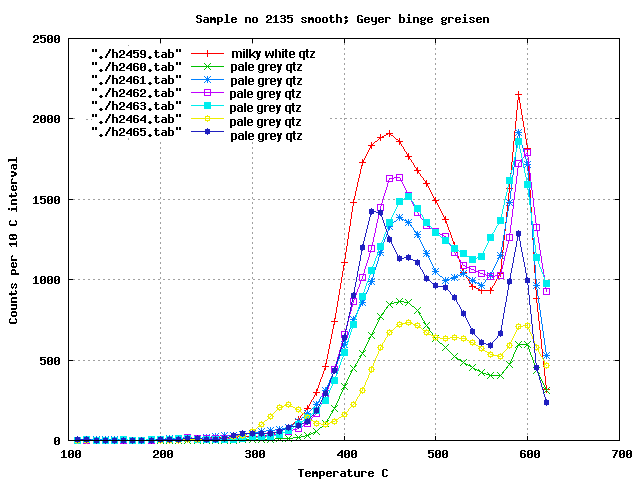 In general, the greisen samples lack any low temperature decrepitation and it is concluded that CO2 rich fluids were only a rare part of the fluid systems which caused these greisens. 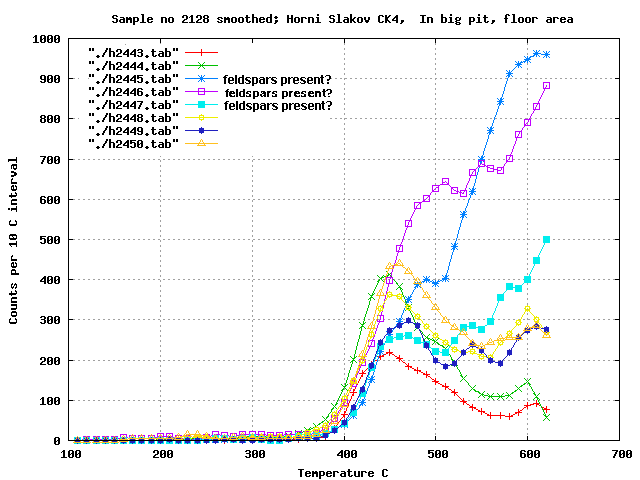 However, a few samples do show signs of CO2 rich fluid involvement. The tin mineralisation in these greisens does not seem to be formed from CO2 rich fluids . Although there are significant variations in the decrepitation between 400 and 600 C, many of the samples were from disturbed loose rock at minesites rather than from undisturbed outcrop so it is not possible to interpret the meaning of these variations based on these samples. When CO2 rich fluids are present, they are of limited spatial and/or temporal extent. Samples 2129 to 2134 were from a collection of rock samples at the geological survey of Saxony at Freiberg. 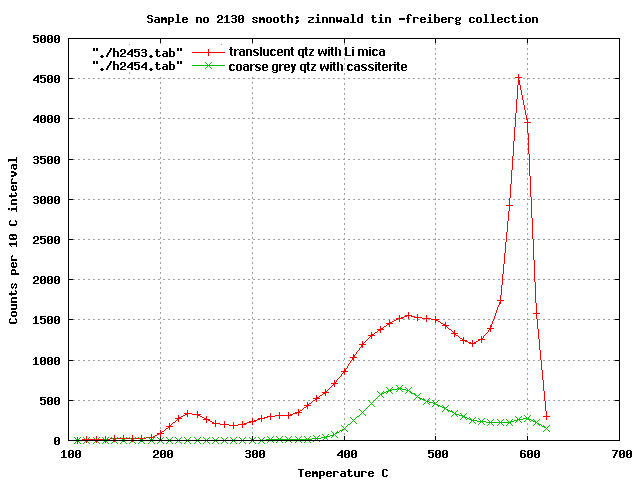 They mostly lack low temperature decrepitation, but several samples do show the presence of CO2 rich fluids, such as sample 2129 from Beierfeld (red). At Zinnwald, two fragments of the same small hand specimen had quite different decrepitation, showing the variation of fluid inclusion populations over a quite small scale of just centimetres. 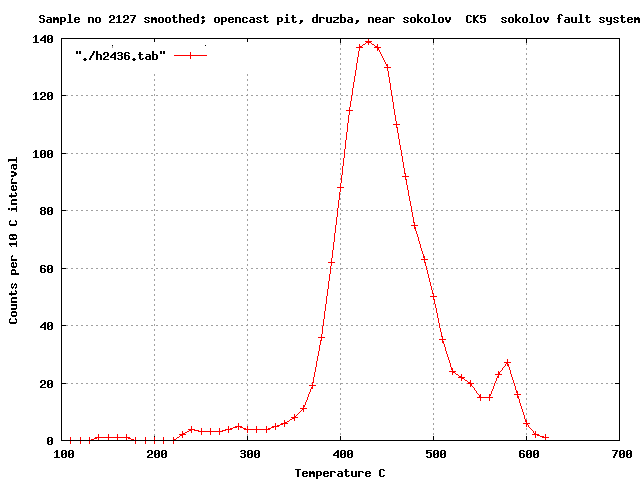 One sub-sample had a significant low temperature peak at 240 C while the other did not. The CO2 rich fluids seem to have been of very limited spatial and/or temporal extent. 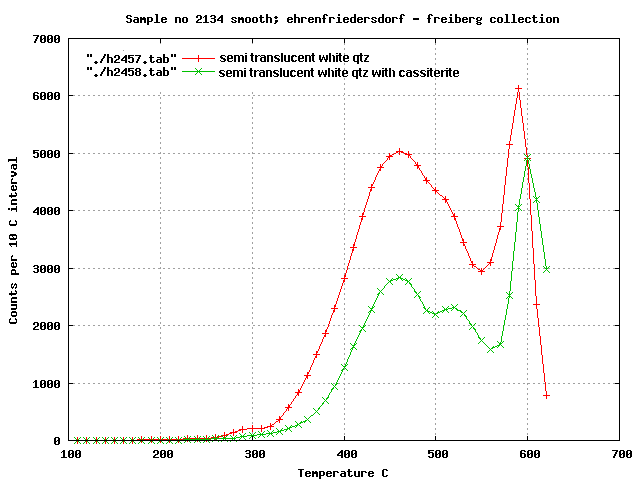 Both sub-samples of the single sample 2134 from Ehrenfriedersdorf had quite similar decrepitation, but there are still some differences even at the centimetre scale. The binge (collapsed mine?) at Geyer is a very large pit resulting from a roof collapse of the old underground workings. The many samples collected here over a diameter of some 400m are quite similar and almost all of them lack low temperature CO2 decrepitation peaks. There are subtle differences in the decrepigrams near 530 C, but these differences cannot be interpreted on this data set. 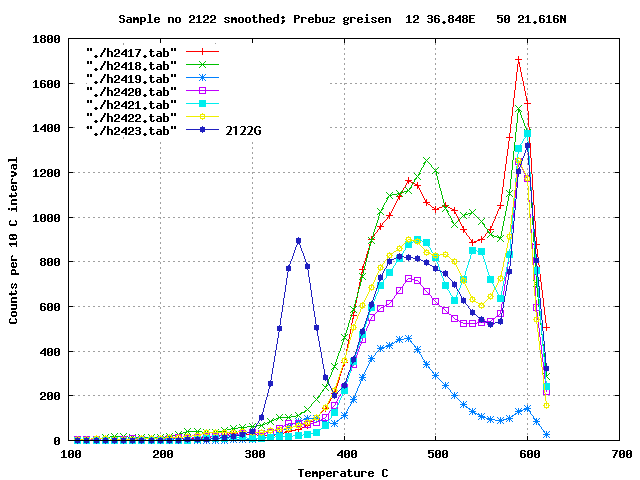 Sample 2135f (yellow) does have a distinct low temperature peak at 340 C which is like that observed on sample 2122g from Prebuz. 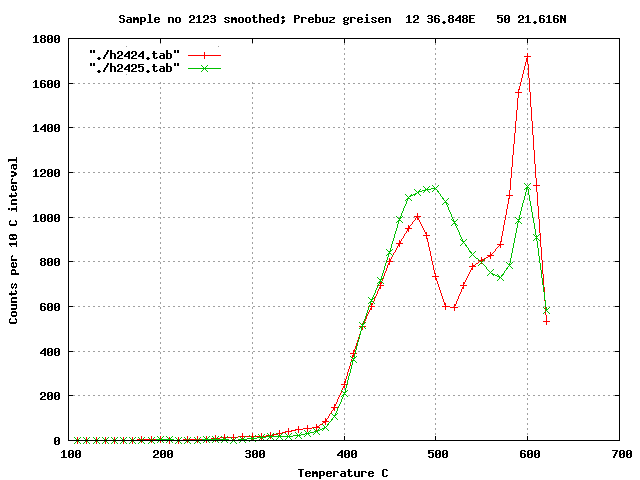 This sample is plotted together with the similar Prebuz sample below. Sample 2136 was of 2 quartz vein fragments occurring as veins in the host rock on the margin of what seemed to be the mineralised area within the binge. These show quite similar decrepitation to those from the main pit area and this quartz was probably formed in association with the mineralising event, rather than being quartz from an earlier regional event. 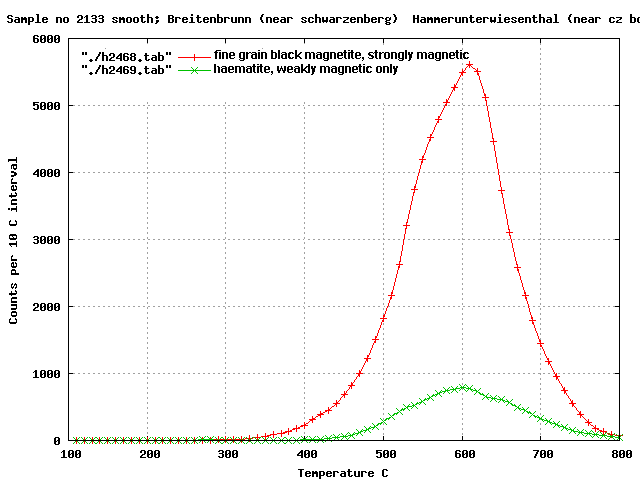 At Breitenbrunn, a sample of magnetite was obtained from a skarn occurrence, primarily for comparison with other magnetite samples from Fe-oxide Cu-Au deposits. The sample was split into 2 fractions, a magnetic one of primarily magnetite and a non magnetic, primarily haematite one. The intense decrepitation is typical of skarn magnetite, in contrast to BIF magnetite which has almost no decrepitation. 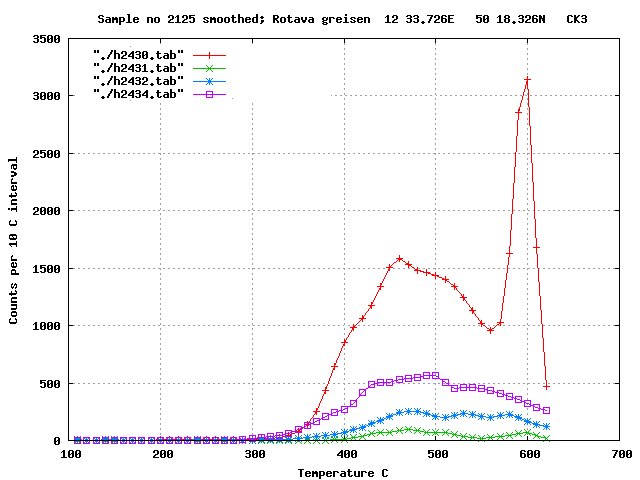 (See here for other Fe-oxide data.) Note that there is substantial decrepitation in the haematite also. This indicates that the haematite is a primary mineral and is not a supergene weathering product from the magnetite, as such weathering would have destroyed the fluid inclusions. The two distinctive CO2 rich samples, one from Prebuz, Czech and the other from Geyer, Germany are shown here together. The occurrence of such narrow and well formed decrepitation peaks at 340 and 350 C is quite unusual. The fluid event which caused this seems to have had a very uniform temperature and composition and was perhaps a single, brief event. These two samples have surprisingly similar decrepitation and perhaps these two distant sites (40 Km apart) experienced the same hydrothermal formation event? As with the nearby greisen samples from Czech, there are only rare CO2 rich fluids in these mineralising systems, which were dominated by aqueous fluids. 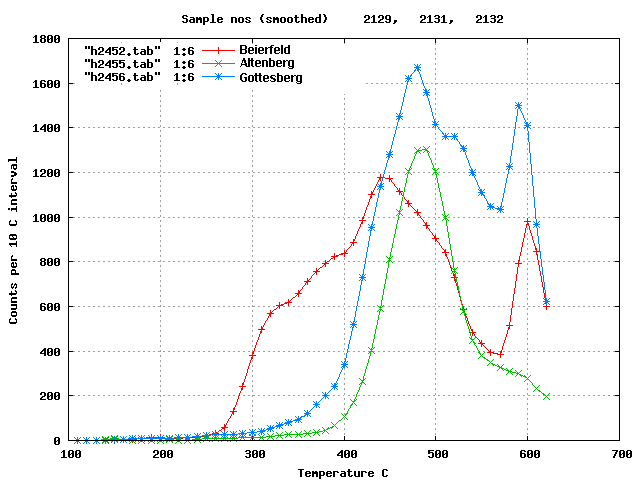 However there are a few occurrences of CO2 rich fluids from Geyer, Zinnwald and Beierfeld. Greisens form within or closely associated with granites, and the hydrothermal fluids involved are almost certainly of granitic origin. This study shows that such fluids are predominantly aqueous, with only minor involvement of CO2 rich phases. A similar lack of CO2 rich fluids is seen in the granite hosted gold deposits of Hebei and Shandong in China. Although CO2 rich fluids are commonly associated with gold deposits, most of them deposit from metamorphic fluids. In contrast, the fluids involved in the formation of greisen deposits like those at erzgebirge are dominantly aqueous with only minor CO2 rich phases.